1877 formula stationery card to Buff Bay bearing red Jamaica Paid One Penny cds and Manchioneal single ring cds, arrival cds at left. Some glue disturbance on reverse, very early use of despatch cds and early date for arrival cds. 1877 formula stationery card to Kingston bearing red Jamaica Paid One Penny cds overstruck Black River cds, arrival cds bottom left. Message on reverse asking for 2 cases of Kerosene; fine condition. 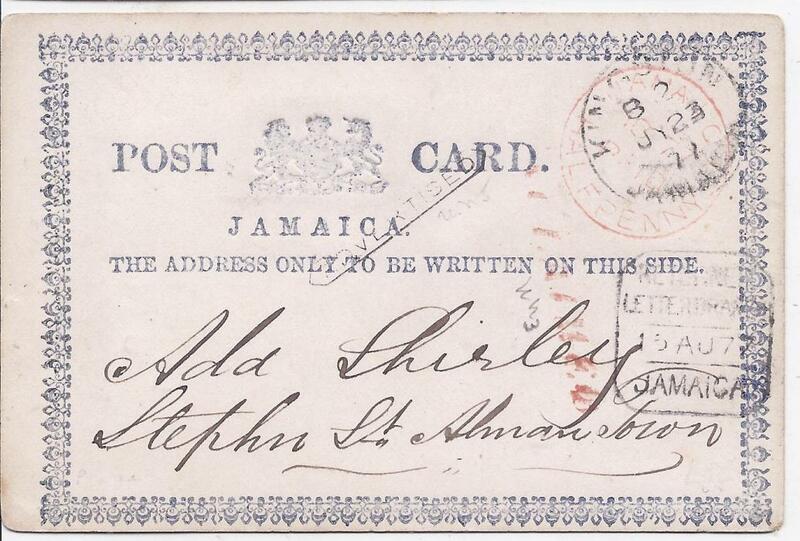 1877 formula stationery card used within Kingston bearing red Jamaica Paid One Penny cds overstruck Kingston cds, small black framed �ADVERTISED� top centre, less clear red straight-line handstamp and framed Returned/ Letter Branch date stamp of 15.AU.77 (The first day of use as noted in Proud).